Are you dealing with uncertainty in relationships? The feeling of not knowing what will happen next is one of the most unsettling human sensations. We get all in our feelings and imagine the worst possible outcomes. We try to walk ourselves back from the edge of panic, but find that it’s like trying to move in quicksand. Uncertainty invites us to abandon perspective. We become myopic, obsessed with the drama or conflict that is happening. We forget to remember the big picture of life. And we forget that all of our struggles pass in time. In fact, indulging the feelings of uncertainty in relationships can cause any situation to spiral into a bigger issue than it is. Recent research from Yale tells us that the brain benefits from volatility and that uncertainty switches on the learning parts of our brain. I’m not advocating for constant chaos, that is not ideal. I am telling you that your struggle can facilitate your growth. So, how do you manage your feelings until you realize your growth? Jot down a few struggles you’ve resolved from your past and notice that they no longer feel so emotionally charged. For me, uncertainty in relationships includes my entire experience of divorce, dating, and parenting. With each encounter, I can see how I problem solved, learned and moved on. Let go of trying to resolve EVERYTHING right now!!! The goal is to do what you can and allow the rest to unfold. You can’t make solid decisions with the information you don’t have. So, sometimes we need to be patient and wait until we have a deeper understanding or more knowledge. Please don’t confuse patience with avoidance. 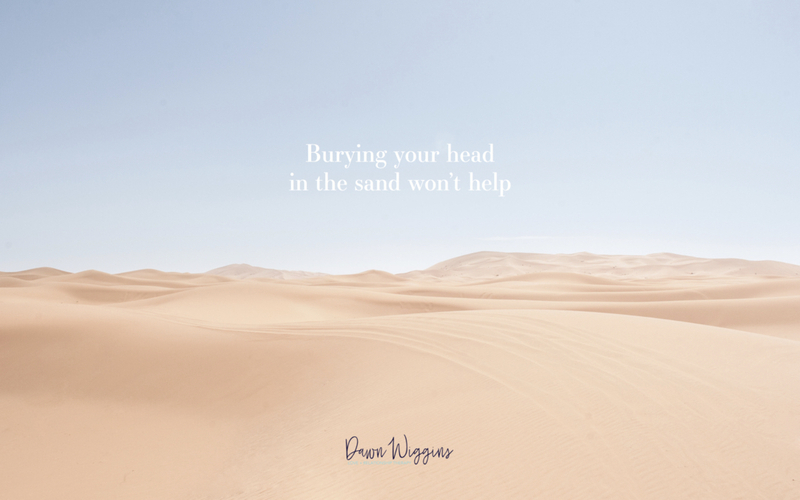 Burying your head in the sand won’t help. In fact, avoidance only creates more significant problems down the road. At some point, you will need to take action. Better to take action from a place of love and clarity than fear, anger or confusion. The strategy is to practice behaviors that bring peace, perspective and hope. For instance, accepting that life may not be how you want it today. And, trust your ability to adapt as needed because hey, you’ve been adapting since conception! A common tendency in times of uncertainty is to blame others for your circumstances. I promise you this won’t work. Blame is only going to fuel anger and resentment. Instead, focus on the idea that this is happening for you, not to you. That idea can be challenging to embrace, yet the Yale research would agree! Stay focused on the lesson and the growth opportunities. Otherwise, you are willingly exchanging your growth for a victim mindset. Finally, I want you to stop rehearsing negative thoughts. It’s limiting your ability to see all of the possibilities. In my experience, even the darkest of experiences have led to surprising outcomes. Most of the time, my fears don’t come true. Instead, the opposite happens; I end up experiencing abundance beyond my wildest dreams. So think big and use that imagination of yours to see a world that wants you to feel loved and worthy – even when you don’t.